It’s simple, really. Yes, I’m one of those annoying people who loves change – which doesn’t hurt – but I’ve been using a foolproof method for years now when dealing with big and small decisions alike, and it works. Sit quietly without distraction and close your eyes. 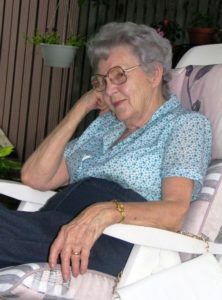 Take a few deep breaths and feel yourself in a rocking chair, on an expansive porch, at the ripe old age of 90. Really dig deep. Cross your hands over the textured afghan on your lap. Feel a warm breeze pick up enough gray hairs to tickle your cheek. Let the sun massage its way into each well earned line on your face. Next step? Think about your decision and let that 90-year-old self reflect back on it, while really feeling from your core. Your 90-year-old self will do one of two things looking back on that decision: feel peaceful with a smile on their face, like my sweet Auntie Lee in this pic, or experience intense regret and sadness with the corners of their mouth on a downward turn. It may sound crazy, but it works for me, every time. 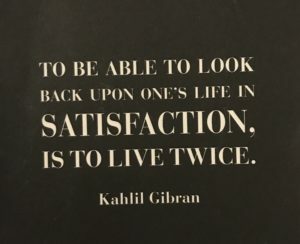 Recently, I saw this quote from Kahlil Gibran that reminded me of why I take the above steps in the first place: because I loathe regret. If I have any, and there is some but not much, it’s either because I made a stupid decision prior to implementing this process, or I ignored my senior self like a pig-headed idiot. I ignore no more. We all have an inner voice, or compass, that knows if a decision is going to be good or bad for us. What we tend to do, however, is ignore it and plunge forward despite the gnawing ache in our solar plexus that’s screaming, “DANGER! BACK AWAY!” When you practice accessing your future self in a state of reflection, and really take heed of their reaction, it becomes harder and harder to screw up. Again, try this, and let me know if it works for you. I’d love to hear your thoughts. And if you haven’t read Kahlil Gibran’s THE PROPHET, your future self will thank you for picking it up – with a smile. Right on time! Thanks for sharing this, my friend.